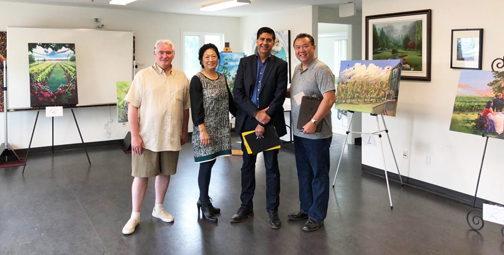 In May of 2018, Vinoscenti Vineyards [15560 Colebrook Rd, Surrey, BC V3Z 0L2], Surrey’s only winery, approached the Arts Council of Surrey [ACS] to host a new Visual Arts event that would conclude with one of the largest cash/prize awards ever provided in the history of the Surrey Visual Arts community. The result was the creation of the inaugural ‘Three Seasons’ Visual Arts competition and exhibition. As the four month long initiative draws to a close, we are excited to announce the three top place winners and two Honourable Mentions. On June 15th, fourteen artists were selected from numerous entries to participate in this annual competition. These artists were: Lora Armbruster, Doris Biddle, Gail Biddle, Melissa Burgher, Caesar Hu, Joanne Dennis, Helmut Gruntorad, Nela Hallwas, Pepe Hidalgo, Yvette Lauer, Carla Maskall, Wendy Mould and Chiao Chiao Yang. After participating in a ‘Plein Air Progress Party’ on July 20th in the vineyards of Vinoscenti and submitting their final work on August 17th, judges were asked to evaluate the work. Judging were Vinoscenti Vineyards owners Dr. Clinton Lee and Serena Lu, Paul R Thompson owner of STCcreatives.com and special guest Surrey Councillor and Mayoral candidate Tom Gill. The criterion was provided by Canadian Federation of Artist Signature Member Perry Haddock. 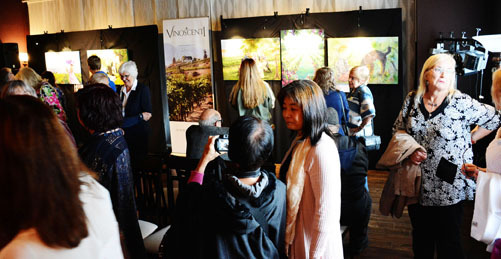 A ‘Three Seasons’ Award Reception, for both artists and public, was held at Vinoscenti Vineyards on Saturday, August 25th from 3-6pm. 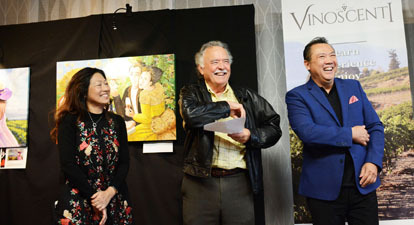 Arriving at the vineyards, approximately sixty guests mingled to the soothing sounds of vocalist Maria Ho, then watched owners Dr. Lee and Serena Lu announced the winners in a unique way which also recognized those artists who did not place. Surrey councillor and Mayoral candidate Tom Gill used his opportunity to address the audience to announce his support for a new Performing Arts Centre. First place went to Caesar Hu [Feature Image Above], Second to Pepe Hidalgo [R] and Third to Doris Biddle [L]. The two Honourable Mentions were awarded to Carla Maskall and Wendy Mould. A festive reception followed with fine wines and delectable edibles provided by Vinoscenti Vineyards. 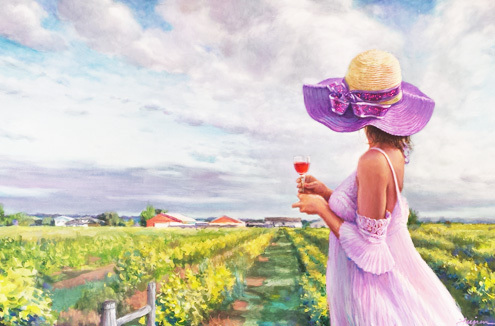 To view all fourteen pieces, including the winners, you are invited to take in the exhibition currently on display at the Vinoscenti Vineyards until September 30th. Many of the art works are available for sale. The ACS would also like to recognize the generous contributions to this event from local business. The sponsorship deck includes: Vinoscenti Vineyards, Birdies & Buckets Family Golf Centre | Stampede Tack & Western Wear | King George Aviation | Wedding Sootra.